It was noon on Friday the 7th of September, and the courthouse was decorated with gold, white and brown decor; string lights and beads adorned the walls and ceiling, with a beige rug running down the centre of the room. Each chair within the court was covered with white sheets and the names of the guests in gold calligraphy. White orchids were at the ends of each row and soft, gentle music played through the speakers. At the very front of the room was a wooden podium, where a golden pillow rested, atop of which were two golden rings with white dragon scales embedded as stones. On either side of the aisle was the seating for the guests of the respective bride - Gwynneth Sellia Helyn Thaena Mohini and Helena Sophia Genma. On the right, for Hel: Sari, Tidus, Rin, Nova, Fernando, Valk and Clark. On the left, for Gwyn: Paula, Javan, Opal, Ami and Suzy. There were a few extra seats for anyone else who wished to join them. Javan was stood at the entrance of the courthouse, waiting for guests to arrive so she could greet them. She was dressed in a soft gold gown that flowed from her waist to her feet and her hair was set as a wave. Pinned to her breast was a white rose and a golden necklace fell around her neck. By her side was Opal, eagerly holding the little pieces of paper with the order of events listed on it. Her long hair was half pinned back and half left to fall past her shoulders as she wore a pale pink dress that ended just below her knees. Much to her dislike, she was not wearing her 3D glasses, but still had the golden star hair pin to the side of her head. Re: The wedding of Hel and Gwyn! Nova is sat in her designated seat, hands on her lap and waiting patiently. She notes that she already gave a gift to Hel and Gwyn earlier in the week, but she brought a bouquet of flowers just so she wasn't empty-handed today. Rin shows up earlier than expected. She gives Javan a nod and Opal a wave as she enters the building. Seeing Nova, Rin jogs over and takes her seat beside her. Once everyone had taken their seats, Gwyn entered the courtroom, accompanied by Paula on her left side. Her hair was pulled back into an elegant style and neatly pinned at the back. Under her horns but atop her head lay a gold and diamond tiara that pulled down between her eyes, matching earrings hanging from her lobes. Her dress was magnificent - a soft blue hue that crossed over to her neck and exposed her midriff - yet covered by golden chains - and the skirt trailed down to the ground, where the hem was decorated with glitter. The belt around her waist matched her tiara, and the chains that roped from the dress to her shoulders, down her arms, ending at the matching bracers which fell from her elbow to her wrists. The chains also decorated her wings, and her feet were clasped with an anklet of similar design. Gwyn's face had a permanent smile, her eyes seeming to glow under the light as she strode down the aisle. She then waited in front of the podium eagerly, her tail swishing under her gown as she impatiently waited for Hel's arrival. Hel will enter with Tidus and Sari on each of her sides. She is wearing a combo of a suit and a dress. Sleeves attached to the low-cut dress that rested off her shoulders, colored a similar blue to Gwyn's own attire. 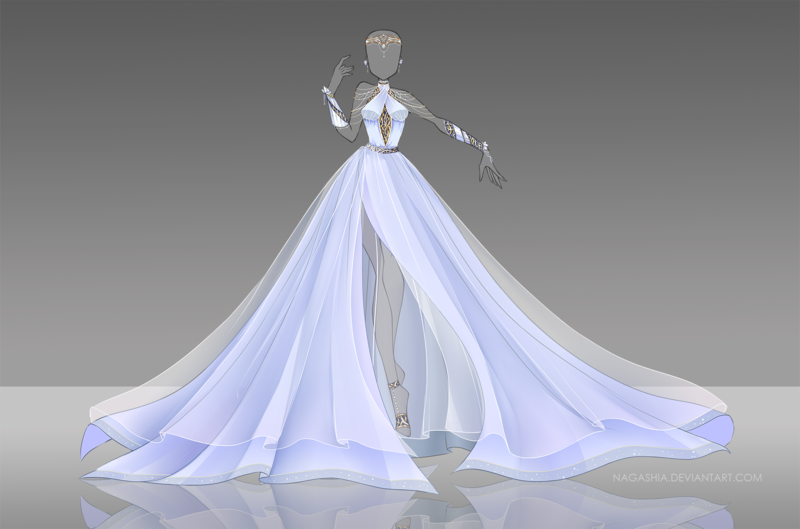 Flowing white fabric fell down to her hands, where they attached to a ring worn on Hel's middle finger, giving a fluid and flowing apparel. 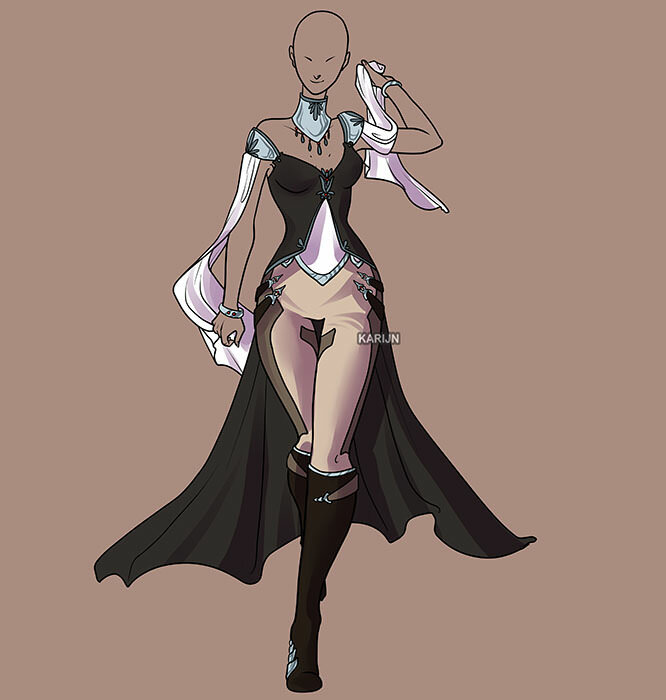 The dark brown dress opened at the front and fell behind, exposing Hel's perfectly toned stomach and the suit trousers she wore. These were beige, with a blue belt that caved down into a "V", and attached to the trail of the mud colored dress with fashionable straps that hooked at her hips. Knee-high boots complimented her outfit, the same muddy brown as the flowing dress-cloak, with blue accent that matched her belt and bracelets. Hel never brakes eye contact with Gwyn while approaching her. Once she is by Gwyn, Tidus and Sari take their seats. The magistrate walked up to the podium and smiled at the crowd. "Please be seated. Good afternoon, ladies, gentlemen, pokémon alike. May I begin with welcoming you all here today to gather for the marriage of Gwynneth Sellia Helyn Thaena Mohini and Helena Sophia Genma. Today marks a new beginning in their lives together, and it means a lot to the both of them that you - their family and friends - are here to witness their wedding vows and to celebrate their marriage." He turned to Gwyn and Paula with a smile. "Who presents Miss Mohini to be married to Miss Genma?" Paula smiles and turns to Gwyn. "I do, her proud mum." Paula gave Gwyn a hug. She breaks the hug and backs away to go sit down next to Javan. With a smile, and Gwyn blushing, he turns to Hel and her parents. "And who presents Miss Genma to be married to Miss Mohini?" Tidus will stand. "I, Tidus Genma, give Hel to Gwyn." He when sits down and Sari takes Tidus's hand and smiles at the couple. He smiled once again and looked back at the audience. "Marriage is a desire by two people to share themselves and their experiences with each other, and a willingness to accept each other for who they are. It is making a commitment to friendship and mutual respect and calls for honesty, patience, courage and of course, humour. Marriage is where each partner is there to support each other in all that they do. Marriage requires closeness and distance – the closeness of a couple growing together and enough distance to allow each partner to be an individual. A good partner in such a marriage will be loving, caring and above all a best friend. It is one of my duties to inform you that this room in which we are now met has been duly sanctioned according to law for the celebration of marriages. You are here to witness the joining in marriage of Gwynneth Sellia Helyn Thaena Mohini and Helena Sophia Genma. If any person present knows of any lawful impediment why these two people may not be joined in marriage he or she should declare it now." He looked around, and Gwyn looked at the audience, anxiously. Rin gives Gwyn an encouraging thumbs up. Clark sits quietly mumbling to himself, making sure to not disturb anyone during the proceedings. Anyone who notices and looks at Clark will see he is smiling, his hands a clasped around his necklace, and his eyes are closed. The is a bright blue light coming from his hands. Fernando is smiling and watching silently, he is happy for both Hel and Gwyn. Meanwhile, anyone particularly perceptive will notice that Clarks Necklace is glowing more than usual. Nova raises no objections. She is just politely observing. Gwyn had tears in her eyes and a smile on her face as no one objected to their union. She turned back to Hel with a smile, beaming happily. With a satisfied nod, he continued, and looked at the two brides before him. "Before you are joined in matrimony here today I have to remind you both of the solemn and binding character of the vows you are about to make. These vows which unite you as wives constitute a formal and public pledge of your love for one another. I am now going to ask each of you in turn to declare that you do not know of any legal reason why you should not be joined in marriage to each other." 'I do solemnly declare that I know not of any lawful impediment why I, Gwynneth Sellia Helyn Thaena Mohini may not be joined in matrimony to Helena Sophia Genma.'" Gazing into Hel's eyes, she repeated the comment. "I do solemnly declare that I know not of any lawful impediment why I, Gwynneth Sellia Helyn Thaena Mohini may not be joined in matrimony to Helena Sophia Genma." He nodded and turned to Hel. 'I do solemnly declare that I know not of any lawful impediment why I, Helena Sophia Genma may not be joined in matrimony to Gwynneth Sellia Helyn Thaena Mohini.'" "Damn I missed my opportunity to object to it being TOO cute"
Hel will smile at Gwyn. "I do solemnly declare that I know not of any lawful impediment why I, Helena Sophia Genma may not be joined in matrimony to Gwynneth Sellia Helyn Thaena Mohini." Another nod and a smile, before he addressed the two. Gwynneth, will you take Helena to be your wedded wife, to share your life with her, to love, support and comfort her, in sickness and in health, whatever the future may bring?" Gwyn looked at Hel and smiled widely, nodding her head briefly. "I will. I call upon these persons here present to witness that I, Gwynneth Sellia Helyn Thaena Mohini, do take thee, Helena Sophia Genma, to be my lawful wedded wife." Her tail was wagging under her skirt. "Helena, will you take Gwynneth to be your wedded wife, to share your life with her, to love, support and comfort her, in sickness and in health, whatever the future may bring?"